My wife and I have been earnestly working on getting out of debt and we are currently down to the last loan. During this time we have been listening to a various outlets seeking advice on what is the best way to become debt free. One of those outlets has been Dave Ramsey. If you are not familiar with Dave Ramsey, he is well known for helping people all over the United States gain financial freedom. Although he can be a little intense his methods, when applied properly, have proven to be successful over time. One thing that I have taken from Dave Ramsey was what he pointed out in these obscure verses in Proverbs. The verses say “Allow no sleep to your eyes, no slumber to your eyelids. Free yourself, like a gazelle from the hand of the hunter, like a bird from the snare of the fowler.” (Proverbs 6:4-5 NIV) At first glance, these verses don’t seem like they make much sense but the lesson that can be learned from them will help in accomplishing your goals in life. If you have ever watched National Geographic or the Discovery Channel, you would have probably come across a scene where a group of gazelles are grazing in an open field. What the gazelles don’t know at the time, lurking off in the distance is their main predator, the cheetah. But all of a sudden, like clock work, one of the gazelles heads pop up and senses that their is imminent danger. Then the gazelles take off running as fast as they can in order not to become prey to the cheetah. 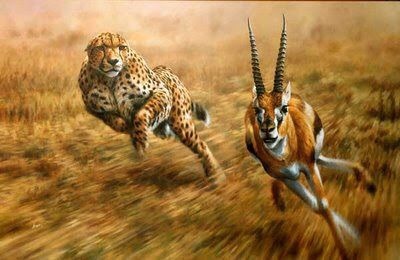 The verse in Proverbs tells us to “Free yourself, like a gazelle from the hand of the hunter.” The gazelle has to run with everything it has in order not to fall prey to the cheetah. In order to free itself, the gazelle can’t become passive in its attempt to escape. It has to be intense in its pursuit of freedom. Now Dave Ramsey uses this example, what he calls “Gazelle Intensity,” when talking to people on how to get out of debt. But I believe this example can be applied to anything we do in life. If we want to accomplish something in life, we can’t be passive about it. We need to attack it with intensity. Just like the gazelle running from the cheetah. If we want to reach our goals in life, we can’t just go at them half-heartedly. We need to put everything we have into the pursuit of them. So what is it in your life that you are trying to accomplish? What goals have you set for yourself that you’re trying to reach? It could be becoming debt free. It could be getting your Masters degree. It could be becoming a home owner. It could be starting a family. It could be being able to retire. Whatever it is don’t be passive about it. Attack it head on. Don’t hold anything back. Be gazelle intense.